Most technology museums are started by people who have a passion for the equipment they have worked with. The Museum of Magnetic Sound Recording in Austin, TX is no exception. Martin Theophilus, founder of Phantom Productions, spent much of his career as a recording engineer, working with analog tape recorders. 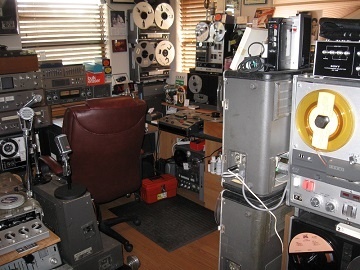 His passion is such that he has turned his entire house into a tape recorder museum. No room has been spared, and he's quickly running out of space. Having never seen a house filled with recorders, this was on the 'must see' list during a recent trip to Austin. It all started in 1998, when a friend gave Theophilus a 1904 Edison wax recorder for Christmas. The unit had been restored and is in near-mint condition. From that moment, the collection has grown exponentially. From 1904, the collection jumps to the 1940s, with a Sound Mirror, the first audio recorder for the consumer market. It used a paper-based magnetic tape, which turned out not to be very durable. Around that time, wire recorders were introduced, and there are few Webster Chicago machines in the collection. There is also a rare Pentron Astra Sonic, which sold in the 1949 Lafayette Radio catalog for $150.00. Wire recorders were a step up from paper tape, but the fidelity wasn't so great, and there was no way to edit programs. Splicing broken wire and having it still pass through the recording head was also problematic. Magnetic tape was already waiting in the wings. The museum has a very complete collection of Ampex recorders, beginning with the model 200A, which was manufactured in 1947. There are also the more familiar 300, 350, 600/601, and 440 machines built in the ‘50s, ‘60s, and ‘70s. 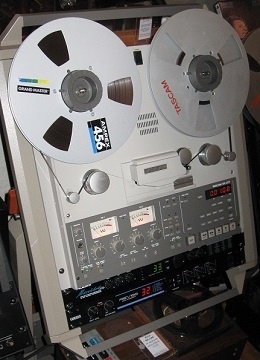 At the end of the parade is the last professional machine from Ampex, the ATR 800, made in 1982. All are in working condition. Teac/Tascam is well represented by a number of machines, beginning in 1956 with the TD 102, and ending with the BR-20, which was built up to 2004. One of the more interesting units is the model 388, which is an 8-channel mixing console and 8-track, 1/4” reel recorder all in one package, a predecessor of Tascam's later porta-studio machines which included a cassette recorder. From the earliest recorders manufactured, the museum's collection extends to some of the last recorders built before everything went digital. Most interesting is the Sony APR 5000, that company's last professional recorder. It had a unique way of making adjustments. Bias, EQ, and levels are all adjusted by top panel up and down buttons. A digital display shows the hexadecimal code for the level, and that is what's recorded in the maintenance log. The only manual adjustments on the machine are for head azimuth and height. And there are a few machines that are just plain weird. 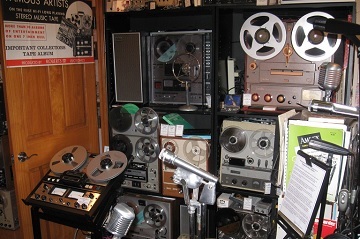 Wanting to work with all magnetic media, one of the museum's recorders will record and play 1/4” reel tape, cassettes, and 8-track cartridges. In addition to tape recorders, Theophilus has acquired many recording accessories for his collection. One of the more interesting is a Heathkit SW-1 Speedwinder, a recent purchase from eBay. It still works, and rewinds reels of tape at an amazing speed. Preserving documentation is also a part of the museum's mission. Over 13,000 images are on loan from the Theophilus vintage recording collection. It is believed that this is one of the largest documentation collections on magnetic sound recording and specifically on reel to reel tape recorders from the 1940s through the present. While much of the material is advertisements for recorders, the collection also includes magazines, catalogs, and operating and service manuals. A major service of the museum is identifying individuals who are still available who made significant contributions to the development and use of magnetic sound recording technology. These individuals are being interviewed, with the recordings being preserved and made available to the public. Among those interviewed: Rupert Neve, Rupert Neve Designs; Robert G. Metzner, founder of Roberts and Califone A/V; Dr. Yoshiharu Abe, father of personal multi-track recording and one of the five founders of Teac; Al Kahn, founder of Electro Voice, and Stefan Kudelski, founder of Nagra professional portable reel tape recorders. With space at a premium, Theophilus has to place limits on what he collects. There are few video recorders, and no broadcast cart machines or 8-track decks in the house, and just a few Tascam 122-series professional cassette recorders. With the equipment now filling his house and recorders numbering around 180 and over 100 microphones, Theophilus is planning for a permanent home for the collection. In 2012 he established a 501(c)3 non-profit organization with the goal of creating a significant permanent museum, open to the public, for the vintage recording collection. 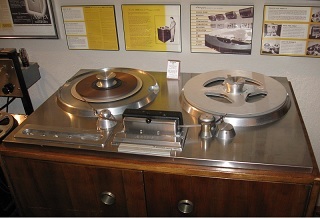 In addition to preserving and displaying the magnetic recording equipment, an additional goal is to create an organization that will: research and archive information about sound recording; cprovide education about the history of sound recording; and display related documents, manuals, catalogs, magazines, and memorabili a. When completed, the museum will display the vintage equipment in a setting that provides a perspective on how the units were used. Most will be able to be demonstrated. There will be rooms that show how early recording studios were equipped. Items will be displayed with memorabilia of the same period. There will be areas for restoration of the equipment where folks can view how the recorders work and see how the technology developed. Initially, the Theophilus vintage recording collection, related documentation and web content will be on loan to and may eventually be donated to the museum once a facility is established. Blueprints for the facility have been drawn up, and fundraising for the new building is underway.